It’s been only 11 days since the Los Angeles Kings won the Stanley Cup, but the front offices of the National Hockey League teams are in full swing in preparation for the amateur draft (June 27-28) and the free agent period, which begins on July 1. The week started out yesterday with a trade between the Philadelphia Flyers and the Columbus Blue Jackets. The two exchanged veterans with Scott Hartnell sent from Philly to Ohio for R.J. Umberger, a 4th round pick in next year’s draft. Will this be the beginning of another shakeup for the Flyers, who have not won the Stanley Cup since 1975? It’s hard to tell so far. For once, they finally have a quality goalie in Steve Mason, but they finished third in the division, not far above the two wild card teams. Hartnell, 32, shook off some early injuries to have a decent year – 20 goals (9 on the power play), 103 penalty minutes, and +11 in 78 games played – but he was pretty much invisible in a seven-game, first-round playoff loss to the New York Rangers. He will have a $4.75MM impact on the Blue Jackets’ salary cap and he has five years remaining on his current contract. Hartnell plays with a rough-and-tumble style that should give the Blue Jackets a more physical presence on the ice. The former 1st round draft pick, sixth overall in 2000, Hartnell spent the last seven years in Philadelphia after six seasons with Nashville. The Predators dealt the left wing along with current Flyers defenseman Kimmo Timmonen for a first round pick after the 2006-2007 season. Hartnell scored a career-high 37 goals and 60 points for the Flyers three seasons ago. Umberger doesn’t represent much of a savings on the cap, (his cap hit is $4.6MM), but his contract is two years shorter than Hartnell’s. 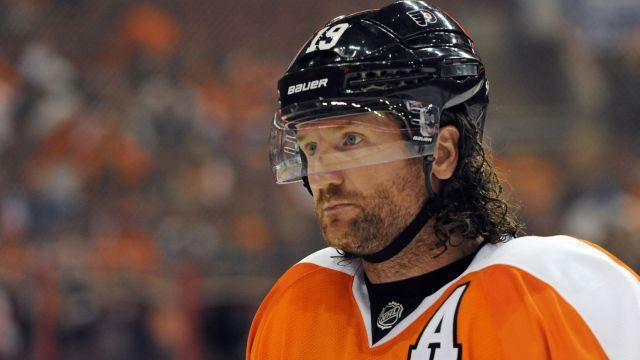 Hartnell spoke with reporters on Monday and said he was forced out of Philadelphia. “A few days ago … four or five days ago now … my agent got the call from Hexy (new Flyers GM Ron Hextall) and said there were a couple of teams that inquired about me. He hummed (sic) and hawed about my role and my position in Philadelphia, and he decided it was best for me to move on from the Flyers”.1 Hartnell had to waive his no-trade clause to make the deal happen. Part of the latest Collective Bargaining Agreement (CBA) was to grant each team two amnesty buyouts. The move allows team to take two salaries off their books without a hit to the salary cap. The team cannot renegotiate a new deal with the bought-out players. Just three players, listed below, have been bought out so far by their current teams. Teams have until June 30 to give players the boot. The salary cap for next season is expected to be about $71MM. This was a no-brainer for Rangers’ GM Glen Sather. Richards’ time in New York has been underwhelming to say the least. While he had a much better season under first-year coach Alain Vigneault than he did in his two years under John Tortorella, Richards was invisible in the Stanley Cup finals, except when he made a mistake. Last season, he managed just one point in 10 playoff games. Even if the Rangers had won the cup, his fate was likely sealed, since the 34-year old stood to make $6.67MM for each of the next six years. Booth scored 60 points in 72 games in the 2008-2009 season, but it has been all downhill from there. The speedy winger, with a history of concussions, tallied just 9 goals and 10 assists in this past season. 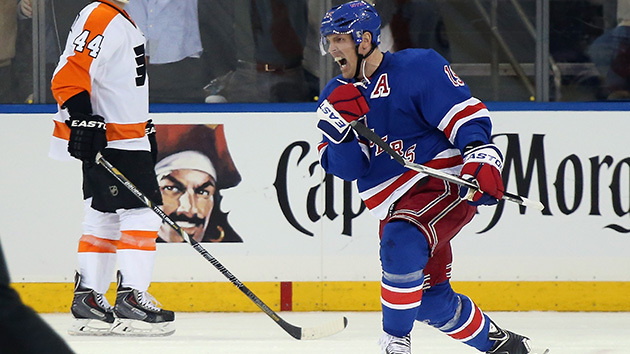 A fired up Brad Richards collected three points in the New York Rangers’ Game 1 victory vs Philly. Winger Jason Akeson was recalled by the Philadelphia Flyers for the final game of the 2012-2013 season. The Flyers repeated the move this season as well and kept him on the roster for their opening round playoff series with the New York Rangers. The 23-year old Ontario native learned a hard lesson in the Rangers 4-1, Game 1 victory. With the scored tied one apiece in the third period, Akeson was careless with his stick and picked up a four-minute minor penalty after he clipped the Rangers’ Carl Hagelin in the mouth. The Rangers took advantage of their good fortunte and took complete control of the game. Flyers’ defenseman Andrew McDonald and Rangers’ forward Matt Zuccarello scored in the first period, but nothing got past Ray Emery or Henrik Lundqvist until the third period. Emery was under tremendous pressure with starter Steve Mason out and his teammates less than stellar performance through the first two periods. Emery’s play kept Philly in the game despite a Rangers 23-14 shots on goal advantage through the first forty minutes of action. Things only got worse when Akeson made his rookie mistake. Rick Nashs’s backhand pass from behind Philly’s end line ricocheted off Martin St. Louis to Brad Richards. The winger blasted a one-timer past Emery from the right circle. Crisp passing led to the Rangers’ second power play goal just 47 seconds later. Defenseman Ryan McDonagh sent the puck to St. Louis near the right post. St. Louis, in turn, moved the puck quickly to Richards at the right point. With everyone expecting a shot, Richards made a hard pass to Derek Stepan, who was all alone at the left post. The University of Wisconsin banged the biscuit home for a 3-1 Rangers’ lead. The Rangers ended up with a 13-1 shots on goal advantage in the final period, with Hagelin the last to light the lamp for New York late in third period. Earlier Friday evening, the Flyers announced that Mason may be ready to go for Game 2 on Sunday after he practiced earlier in the day. Goaltender Henrik Lundqvist’s return to form greatly improves the New York Rangers’ chances of a deep playoff run. Oftentimes when discussing the franchise players of an NHL team, the conversation begins and ends with a forward. When discussing the New York Rangers, their franchise player is most obvious – goaltender Henrik Lundqvist. The Rangers signed Lundqvist to a seven-year extension this past December. The new deal quickly drew criticism as Lundqvist struggled in the month of December, posting a 4-4-2 record with a 3.08 goals against average (GAA) and an .889 save percentage (SV%) for the month. 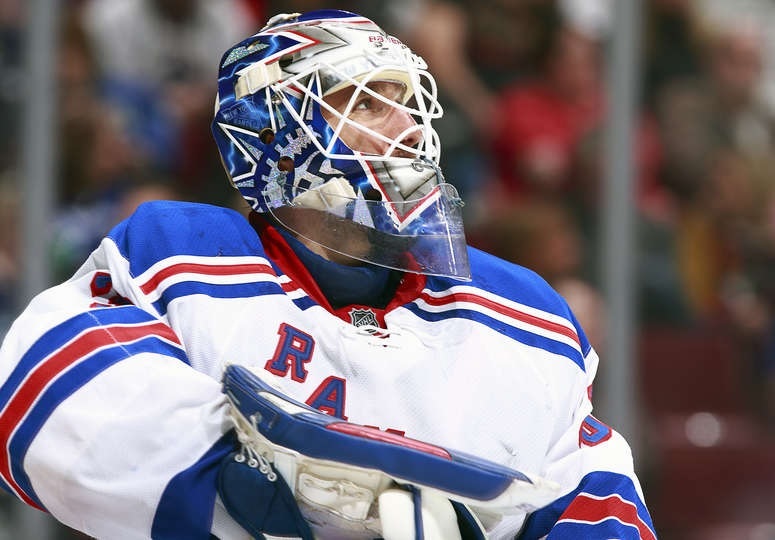 Backup goalie Cam Talbot performed admirably during Lundqvist’s struggles. In fact, it was Talbot’s play which carried the Rangers while Lundqvist struggled to regain his form. Lundqvist regained his form and was his stellar self during the Sochi Olympics in February, leading Sweden to a silver medal. After his stellar play in the Olympics, Lundqvist retained his stellar form for the rest of the season. Over his final 33 games, Lundqvist was 21-9-3 with a 2.08 GAA, .931 SV% and three shutouts. Although not an offensive juggernaut, the Rangers do have skill up front. Mats Zuccarello led the Rangers with 59 points in 77 games this season, while center Derek Stepan registered 57 points in 82 games. The Rangers’ offensive output could have been much better if not for the disappointing season by Rick Nash, who tallied a disappointing 26 goals and 39 points in 65 games played. In need of offensive punch, the Rangers traded Ryan Callahan to the Tampa Bay Lightning in exchange for Martin St. Louis. St. Louis posted a dismal eight points in 19 games with the Rangers. Although St. Louis had a rough transition to New York, his high level of offensive talent is undeniable and will be needed in the playoffs. St. Louis had 24 points in 23 games when the Lightning won the Stanley Cup a decade ago. Lundqvist is arguably the best goalie in the NHL and has an excellent group of defensemen in front of him. Dan Girardi dished out 191 hits in 81 games and also blocked 174 shots, 8th among NHL defensemen. Ryan McDonagh blocked 131 shots in 77 games and Marc Staal blocked 84 in 72 games. McDonagh is perhaps the NHL’s most underrated defenseman, as he brings a superb two-way game to the ice. He is quick to read plays and close off the passing lanes while also providing excellent puck movement and offensive ability. McDonagh registered 43 points in 77 games this season. Casual hockey fans knowDuncan Keith, Shea Weber and Erik Karlsson, but McDonagh also deserves mention as an elite defenseman. He missed the last three games of the regular season after suffering a shoulder injury. For their first dozen games this season, the Philadelphia Flyers looked as bad as the Buffalo Sabres did all season. Head coach Peter Laviolette was quickly fired after losing the first three regular season games by a combined score of 9-3, and was replaced by Craig Berube. After their first 15 games, the Flyers were 4-10-1 and looked nothing like a playoff team, but finished with 16 wins in their final 27 games. Despite the team’s slow start, Claude Giroux was once again among league leaders in scoring. Giroux registered 28 goals, 58 assists (4th) and 86 points (3rd) in 82 games. He also ranked fourth in the NHL in power-play points with 37. Jakub Voracek (62 points) and Scott Hartnell (52 points) reaped the benefits of playing on Giroux’s line. Giroux’s presence on the power play also benefitedWayne Simmonds, who scored career-bests in goals (29), assists (31) and points (60) this season. Simmonds’ ability to crash the net and screen the goalie will be vital to the Flyers’ chances of scoring goals against Lundqvist. Brayden Schenn and Sean Couturier continue to improve, while Vincent Lecavalier and Matt Read bring more goal-scoring depth to the team. It might be harsh to say the Flyers’ defense is terrible, but they are far from spectacular. Luke Schenn delivers highlight-reel hits and has improved his play in the defensive zone; however, he has untapped offensive potential. Veterans Kimmo Timonen and Mark Streit set the tone for the defense with their puck movement, which established the Flyers among league leaders on the power play. It was no coincidence that the Flyers’ hot stretch run coincided with Streit’s own hot streak, which helped him to compile 44 points. The Flyers made a prudent move during trade deadline week in acquiring defenseman Andrew MacDonald from the New York Islanders. MacDonald has been superb defensively for Philly and has shown the ability to make smart decisions with the puck. Between his time with the Islanders and Flyers this season, MacDonald led all NHLers with 242 blocked shots in 82 games. Montreal Canadiens’ defenseman Andrei Markov was a distant second with 180. Steve Mason was solid in goal for the Flyers, having gone 33-18-7 with a 2.50 GAA, a .917 SV% and four shutouts. While Mason’s numbers may not rank among the elite, he was strong in goal for the Flyers and stole some victories in games they had no business winning. The Flyers’ defensive lapses contributed to Mason’s non-elite numbers, but he also made up for their play many times. Injuries could play a factor in the series. Mason – upper body injury – did not travel to New York for game one Thursday night and is questionable for game two. The pressure falls on backup Ray Emery, who had less than a spectacular season. Emery had success and playoff experience with the Ottawa Senators earlier in his career, but has been a fringe backup since then. Despite the Flyers’ star power in Giroux, their offensive depth, and the solid play of Mason, the Rangers should win this series. It will likely be the best series in the first round of the Eastern Conference. If Lundqvist and the Rangers defense can keep the Flyers off the scoreboard, the Rangers will likely eliminate the Flyers in four or five games. If the Flyers can get to Lundqvist with some three-goal games, the series could go the distance. The Flyers made an admirable turnaround after a horrid start to the season, but the Rangers may be the worst first-round match they could have received.